UPDATE: Ubisoft Massive discuss further console settings that could improve performance. 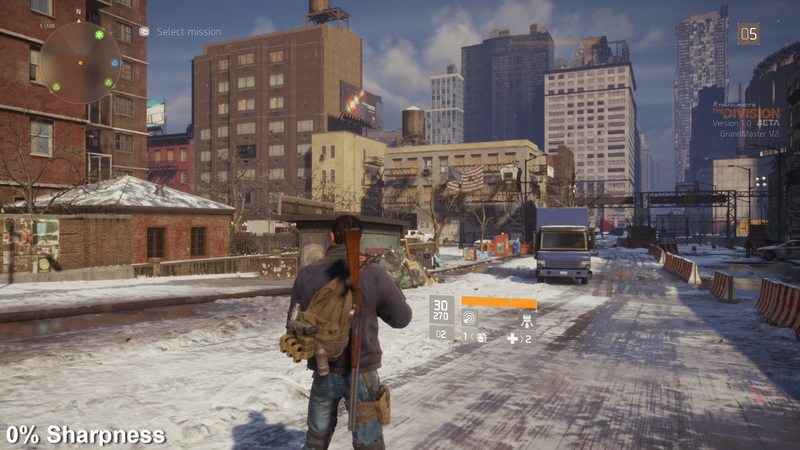 UPDATE 7/2/16 12:15pm: A recent Q&A session with Ubisoft Massive reveals that final PlayStation 4 and Xbox One builds of The Division could feature even more graphics settings. A developer revealed it's possible to tweak the game's lighting to improve frame-rates. In theory, this will let users balance the visuals and performance as they please. "It's actually great that we're given the option you can actually disable certain lighting aspects to improve frame rates in the console versions. I don't know another game that does that. So if you want to choose frame-rate over visuals, you can if you want." It's an interesting development if true (and not simply part of the team's debug tools), and also a departure from the plug-and-play ethos that usually goes with console gaming. This lighting option is not available in The Division's recent beta - where only toggles for chromatic aberration and sharpness are shown. Given performance is also a capped at 30fps on console, it's unclear if this will unlock the frame-rate somehow to achieve higher rates. Assuming that frame-rate stays capped, performance profiling of the beta suggests that gains here would be limited: PlayStation 4 is already locked at 30fps, based on the beta code, though freeing up GPU cycles could smooth out the small dips in Xbox One performance, or perhaps lessen the impact of the dynamic resolution scaler. 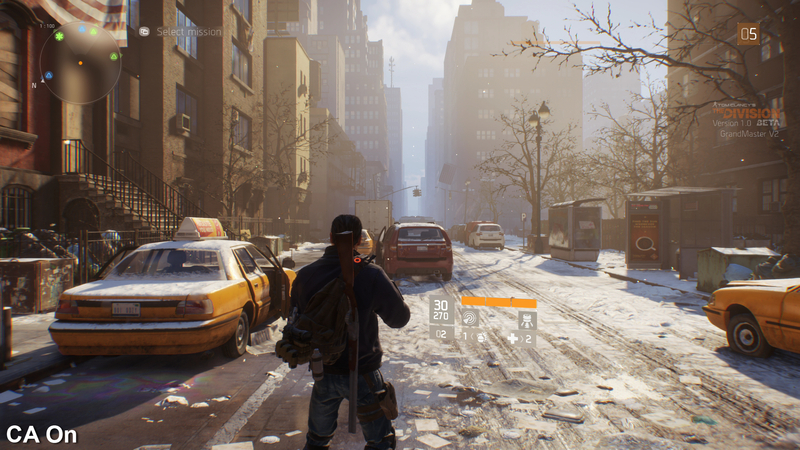 Original story: The Division beta on Xbox One is a gorgeous beast - bringing some of the most striking volumetric fog effects we've seen on any platform to date. But before you get started, you might want to check some of the options Ubisoft includes in its "Visuals" menu [UPDATE 29/1/16 2:20pm: We can now confirm that the PlayStation 4 beta has exactly the same settings menu]. Image quality can be improved quite visibly by tweaking two settings in particular: chromatic aberration and image sharpen. The first is a toggle. Chromatic aberration is a post-process effect (much like bloom, HDR or motion blur) that's enabled by default on this Xbox One beta. To date, the effect has appeared in a raft of high-profile titles, from a rather heavy-handed use in Bloodborne and The Order 1886, to the light dab applied in Grand Theft Auto 5. It's designed to mimic the properties of a camera lens, taking the high contrast points visible on-screen, and splitting them into their red, green and blue constituent parts. The result gives a slightly decayed look The Division is going for - but it might not suit all tastes. The good news? For those who don't fancy it, Ubisoft has you covered, and this toggle cuts the effect out from all gameplay, and also the The Division's unique augmented HUD. 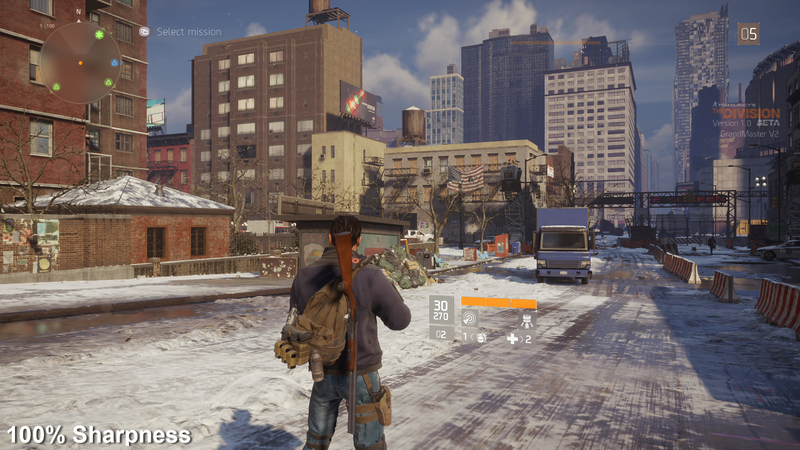 A video overview of The Division beta's visual settings and the impact they have on the presentation of the game. It's an option we hope to see from more developers in future on PS4 and Xbox One. This calls to mind another extensive post-effects menu included in console versions of Project Cars (featuring a whole range of toggles, for god rays and vignetting too). However, whether enabled or not, this will likely have no affect on your frame-rates - only image quality. If you're not certain, it's worth experimenting with this toggle, and seeing how the results hold up for you. Curiously the 'sharpen image' slider also has a big impact on image quality. 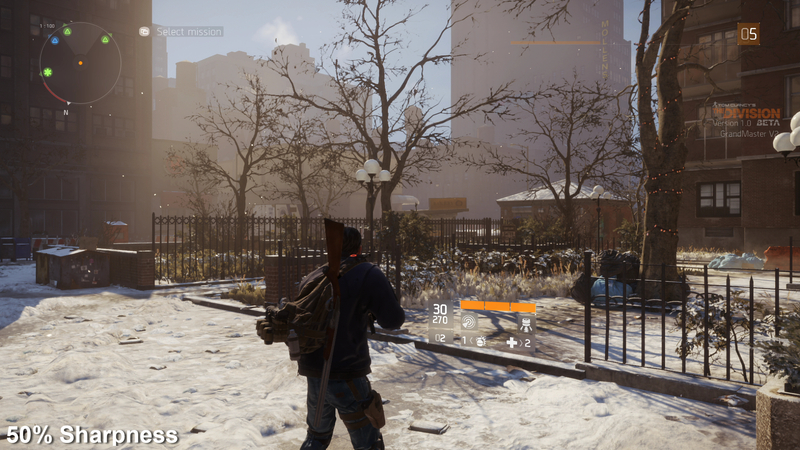 It directly controls the strength of The Division's anti-aliasing method on Xbox One - a post-process technique. Sliding this up to 75 creates a noticeably clearer horizon as you sprint down New York's ruined, wintry streets. It alleviates some of the residual blur we get with its AA approach, but there's a catch. Veering towards 100 per cent on the scale, a white halo effect is apparent on stair-step edges - and the overall balance of this setting ultimately comes down to personal preference. It's unusual to get these options on console, and it's great news they're added this time. More so than most games, there's a way to get a better look out of The Division on console if you're willing to experiment with each. For more technical info on The Division, Digital Foundry will be looking at Xbox One, PS4 and PC versions (where the beta starts Friday at 12pm GMT) very soon. Stay tuned! Chromatic aberration is enabled in The Division, but console owners are welcome to toggle it off. Note the distortion to colours towards the screen's edges. Another shot showing the impact chromatic aberration has on The Division's final image. Image sharpness is tweakable too, affecting the intensity of the game's anti-aliasing. Note: pushing this setting too high produces a white halo artefact around edges. At range, The Division's streets looks clearer when this setting is raised, but a balance has to be struck. 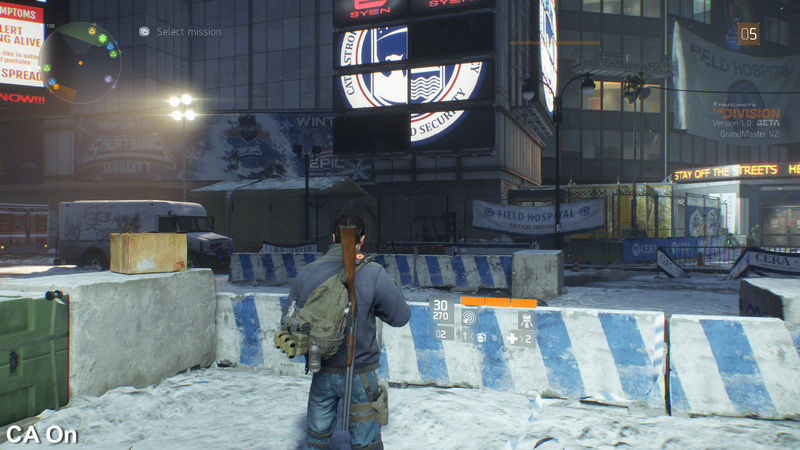 For all the gameplay help you could possibly need, take a look through our Division guide. Our essential guide to Ubisoft's loot-stuffed shooter. A walkthrough for every mission currently available in the game.